To see David Schweikart's talk, click here. Title: "Economic Democracy: Economic Infrastructure and Ethical Foundation"
Abstract: Margaret Thatcher famously coined the phrase, TINA: There Is No Alternative (to capitalism) and it's often said these days, "It's easier to imagine the end of the world than the end of capitalism." I will argue that both claims are wrong. There clearly does exist an economically viable, ethically desirable alternative to capitalism, which I like to call Economic Democracy. I will lay out its basic infrastructure, then show why it would be vastly preferable, on both economic and ethical grounds. Bio: David Schweickart is Professor of Philosophy at Loyola University Chicago. He holds Ph.D's in mathematics and philosophy. He is the author of three books and coauthor of one, his latest being After Capitalism (2002; Chinese translation 2005; Slovak translation, 2010, 2nd Edition, 2011, Chinese translation 2015). He is also the author of numerous articles in social-political philosophy. His work has been translated into Chinese, Spanish, French, Norwegian, Slovak, Farsi, and Catalan. He has given presentations in the U.S., Canada, Mexico, Cuba, El Salvador, Venezuela, France, Germany, Norway, Sweden, Spain, Italy, Greece, The Czech Republic, Slovakia, the Philippines and China. To see Asad Haider's talk, click here. Title: "Organization, Class, and the State"
Abstract: Those who have followed the wave of social movements going from Occupy Wall Street through Black Lives Matter to the Bernie Sanders campaign will recall that organization was an absolutely central axis of strategic debate, inviting comparisons to the history of past movements. Many of these debates focused on the difference between "horizontal" forms of organization and the form of the party. In studying both these contemporary movements and the history of parties and unions, it becomes clear that every social movement practices a determinate form of political organization, which it represents to itself with varying degrees of theoretical efficacy. Yet unlike other primary terms in the discourse of social movements - power, democracy, citizenship - "organization" is rarely granted the status of a philosophical concept. 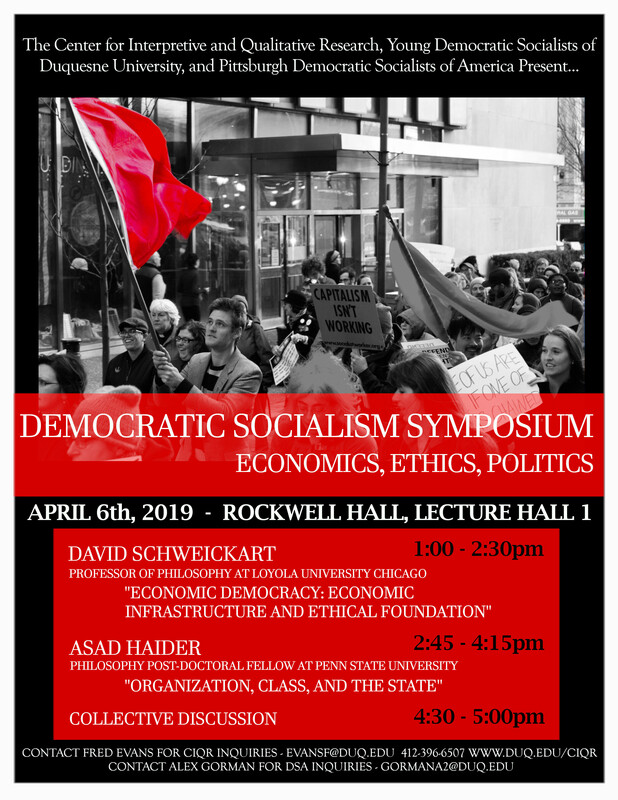 This talk seeks to trace an underground current of political theory that focuses on the issue of organization, by examining certain aspects of the European Marxist debates over the party form and revolutionary strategy in the 1960s and 1970s, which represent a sustained and original theorization of the concrete problems of strategy and organization, in close connection with mass movements. We will focus on the development of Marxist philosophy by situating it not only in the debates over Communist Party strategy, but also in relation to the formation of new organizations that challenged the Party's hegemony. Bio: Asad Haider is the author of Mistaken Identity: Race and Class in the Age of Trump (Verso 2018), and the founding editor of Viewpoint Magazine, which has since 2012 been one of the most vibrant and exciting journals of contemporary Marxist thought. He is a Mellon Post-Doctoral Fellow at Penn State in the Philosophy Department there, with a PhD from the History of Consciousness Program at UC Santa Cruz.